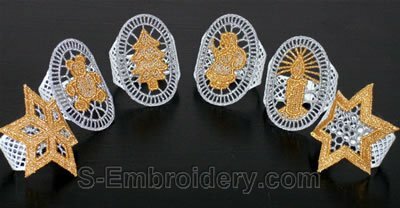 An elegant set of 6 Christmas freestanding lace embroidery napkin rings. They are easy to produce and due to their design they are also easy to wash and iron. These designs would make a fine complement to our SKU10291 Christmas Lace Embroidery ornaments. Excellent designs! Great fun to stitch and give to make someone else smile. The bookmarks and bells I have completed are absolutely beautiful. I love them. Great gifts and bazaar items.